Funny, I never called dressing, dressing until we moved to Georgia when I was a kid. I remember being very confused when my friends at school would call it dressing. I always though of dressing as salad dressing. You know ranch…thousand island? I also had a though of the turkey wearing a dress, but I knew that couldn’t be right. My mom always stuffed the bird, so it was stuffing but, we called it stuffing even if it even if it wasn’t stuffed. 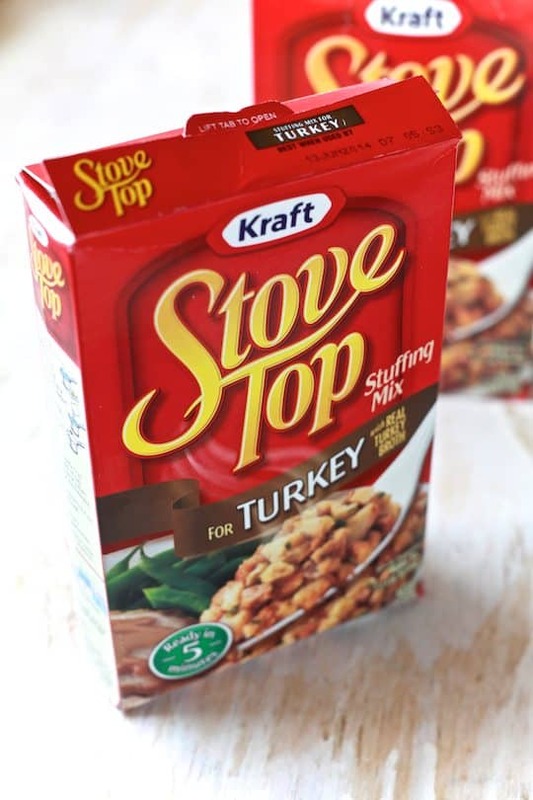 The Stove Top box says stuffing mix, so is it still dressing? What a conundrum. 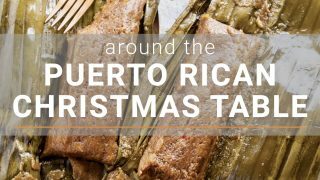 When you think of Thanksgiving you may first think of the turkey, but I always think of Mami’s stuffing. I LOVE my mother’s stuffing! I would hover around sneaking bites before the stuffing ever hit the table. I LOVE STUFFING!! 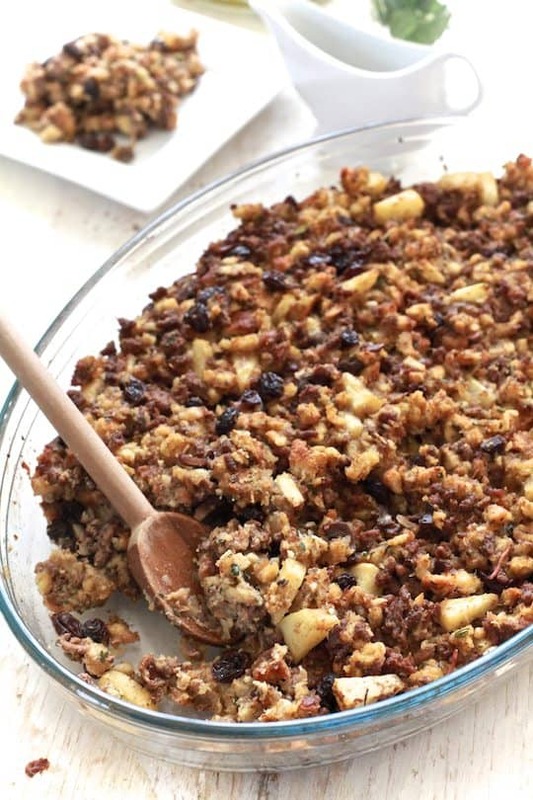 But, this is my favorite stuffing in the whole world! We are going to start with the neck and giblets. I know, it’s not pretty, but it makes good eats. After they have been cook of course. Remove the gizzards and neck from the turkey and rise clean. Place neck and giblets in a pot and fill with enough water to cover, about 3 cups. Cover and bring to a boil, uncover and lower to a simmer for 1 hour. Using a slotted spoon remove giblets from broth, reserved broth, add 1 stick of butter to broth and keep at a simmer over low heat . Pick meat off the neck and chop giblets, set aside. 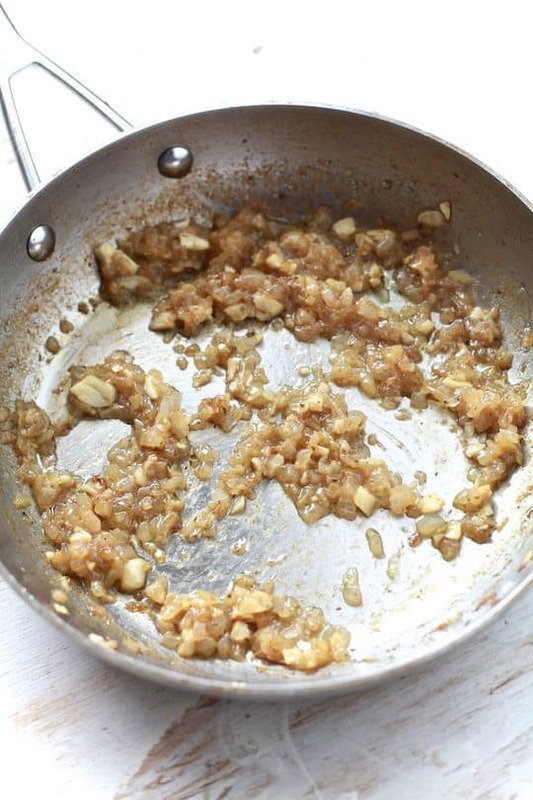 In a skillet heat olive oil, sauté onion, garlic and recaito over medium heat for 3-4 minutes. Add ground beef and cook till brown. Stir in chopped neck meat and giblets, apple, raisins, sage, pepper, and salt. 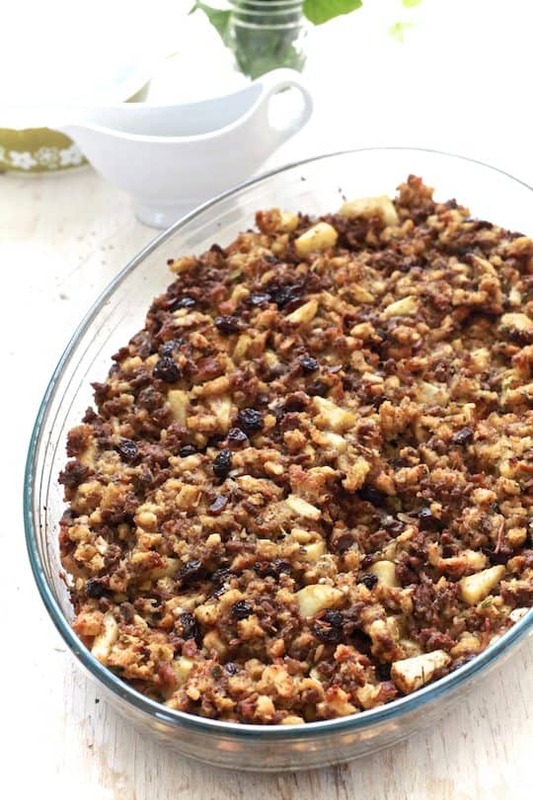 Pour bread crumbs in a large bowl, combine with meat mixture. Add enough broth to moisten, about 2 3/4 cups, tossing lightly to combine. I use Stove Top because it’s what my mother used, but you can use any stuffing or dressing mix. You can even make your own if you like. Place dressing in a 2-quart casserole pan. Bake, uncovered, in a 375 degree F oven for 15 to 20 minutes or until heated through and top is browned. What am I going to do now? 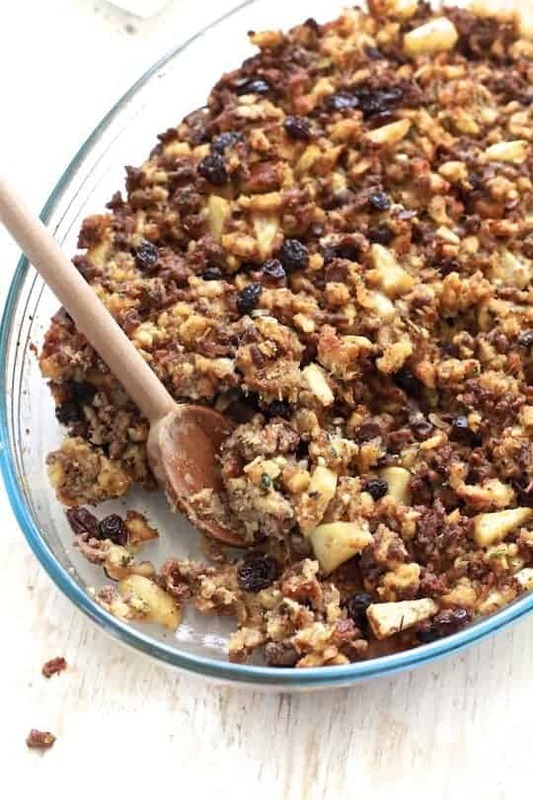 I have a giant casserole dish of stuffing…sorry dressing, in my kitchen calling my name. I guess I will have to clean off my favorite big spoon and chow down? I love this dressing not only because it’s how my mom makes it and it brings back memories of my childhood, but it is also chock full of delicious goodness. There are nuggets of meat and morsels of sweetness, it’s love in a casserole dish. Leftovers are the best because I can make turkey sandwiches with stuffing and cranberry sauce. Looking for a killer turkey recipe for your Thanksgiving feast? Check this one out! Remove the gizzards and neck from the turkey and rinse clean. 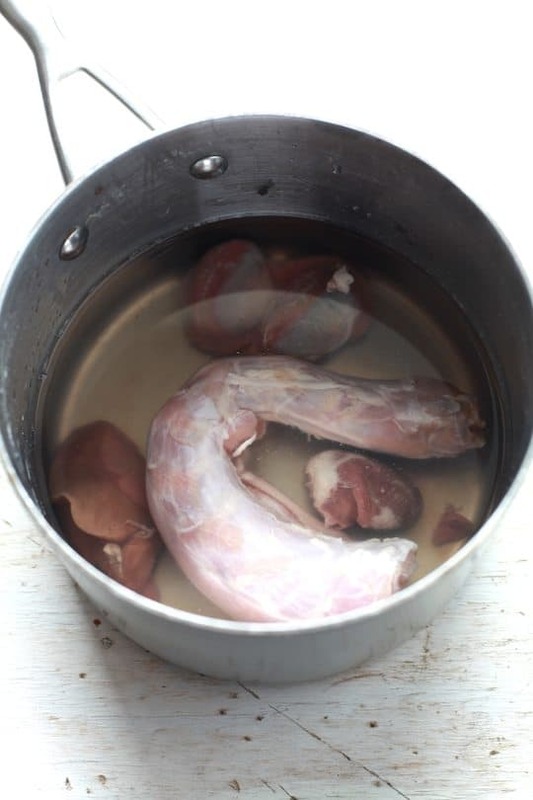 Place neck and giblets in a pot and fill with enough water to cover about 3 cups. Cover and bring to a boil, uncover and lower to a simmer for 1 hour. Using a slotted spoon remove giblets from broth, reserved broth add 1 stick of butter to broth and keep at a simmer over low heat. Pick meat off the neck and chop giblets, set aside. In a skillet heat olive oil, sauté onion, garlic, and recaito over medium heat for 3-4 minutes. Add ground beef and cook until brown. 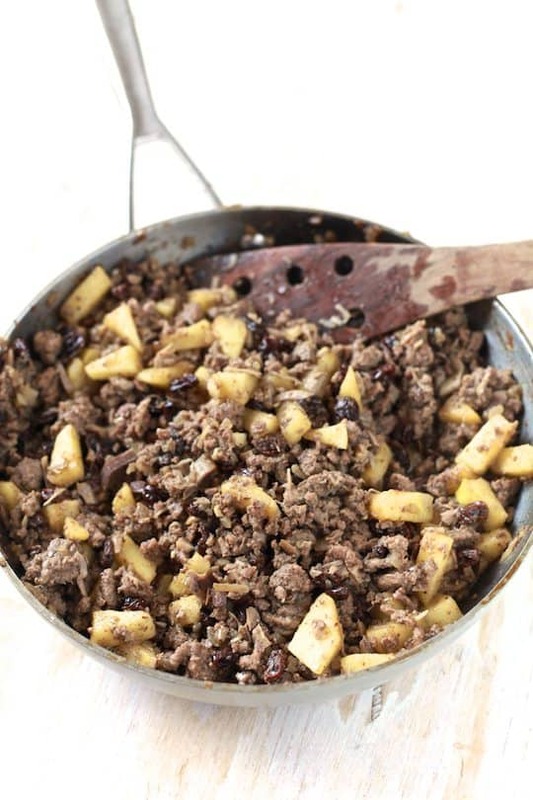 Stir in chopped neck meat and giblets, apple, raisins, sage, pepper, and salt. 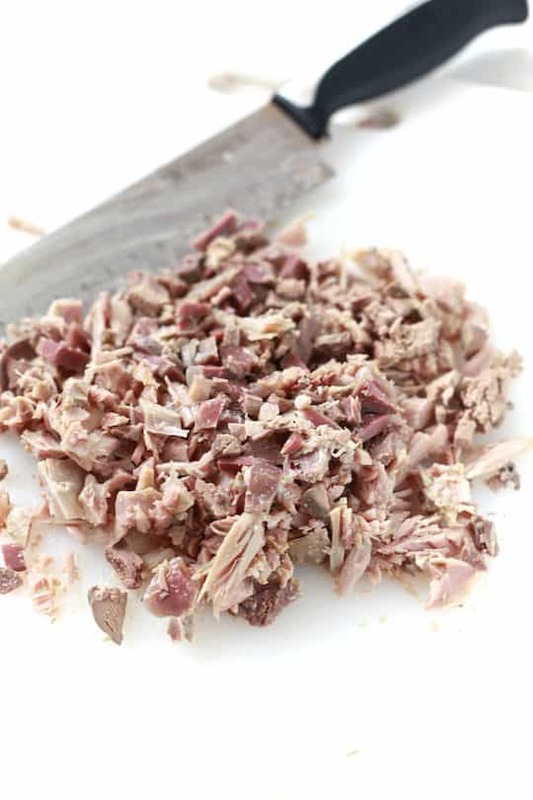 Pour bread crumbs in a large bowl; add the meat mixture. Add enough broth to moisten, about 2 3/4 cups, tossing lightly to combine. Place dressing in a 2-quart casserole pan. Bake, uncovered, in a 375 degree F oven for 15 to 20 minutes or until heated through. Makes 10 to 12 servings.